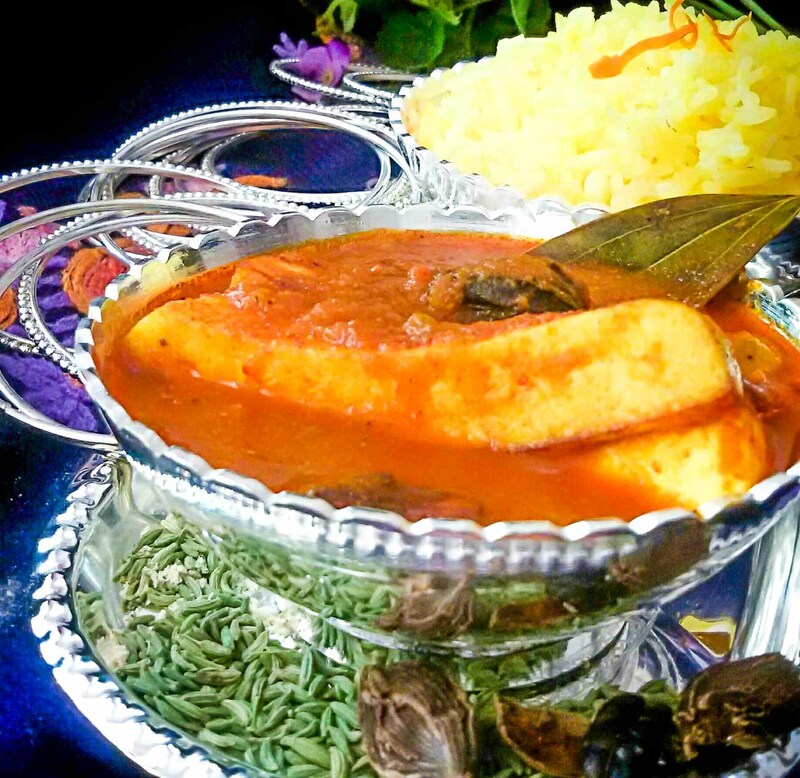 Kashmiri Style Paneer gravy is a no onion no garlic delicious Indian Vegetarian Dinner Recipes made with pan fried paneer in a flavorsome tomato gravy. Relish it along with any Indian Breads like naan, roti kulcha. 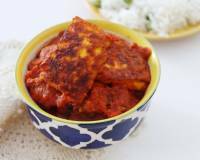 Kashmiri Paneer Gravy recipe is a popular Paneer preparation made with pieces of fried paneer (cottage cheese) simmered in a tomato sauce flavoured with spices and fennel seeds powder. It makes a quick and easy weeknight dinner. 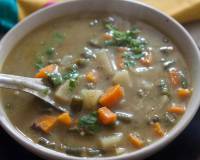 It's a simple gravy to prepare at home with minimal ingredients. 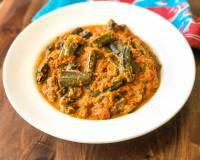 This recipe has influences of the Kashmiri Pandit style of cooking which does not include any onions or garlic in their recipes. 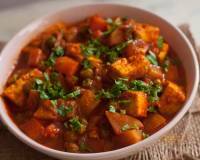 Serve Kashmiri Paneer Gravy Recipe along with Roti, Naan or Kulcha or Kashmiri Kesar Pulao and Fresh & Juicy Chickpea Salad with Fruits & Vegetables for a delicious weekend meal. 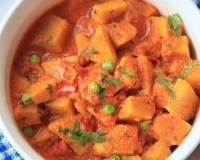 To begin making the Kashmiri Paneer Gravy Recipe, we need to make sure that we have the homemade tomato puree. Here's how to make homemade tomato puree. Next we boil 2 cups of water with a pinch of turmeric. Once the water is boiled, turn off the heat. We will use this water to place fried paneer pieces. 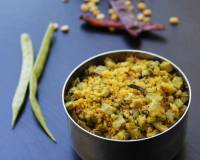 Place a kadai on medium heat and add 2 tablespoons mustard oil. Add the cut paneer pieces into the pan and shallow fry the paneer until you get a nice golden brown colour on all sides. Turn off the heat. Drop the paneer pieces for the Kashmiri gravy, into the prepared hot turmeric water for few minutes. 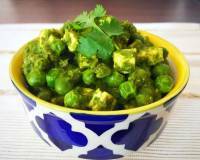 It will prevent the paneer from becoming chewy and keep the paneer soft. Into the same pan, add one tablespoon oil. Add badi elaichi, green cardamom, bay leaf, hing and cinnamon stick. Saute for a minute until the aromas of the spices wafts in the air. Next add the homemade tomato puree along with red chilli powder and dry ginger powder. Stir well until all the masalas are well combined and the masala easily comes off from the sides of the kadai. Add 1/2 cup water, mix well and simmer for a few minutes. Finally add the fried paneer cubes, garam masala powder and ghee, cover the kadai with the lid and allow it to cook for 2 minutes. After a few minutes, switch off the heat. 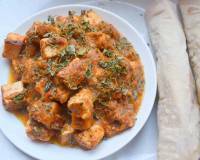 Garnish with chopped coriander leaves and your Kashmiri Paneer Gravy is ready to be served.